With the 2018 elections already underway, senators chided the current and former secretaries of Homeland Security on Wednesday for not more strongly warning the American public about past Russian intrusions in state election systems and for a lack of urgency to protect balloting this year. 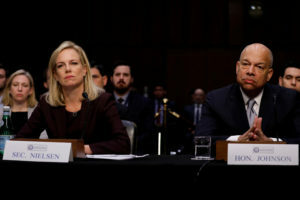 Kirstjen Nielsen, President Donald Trump’s secretary of Homeland Security, testified alongside Jeh Johnson, secretary under former President Barack Obama, as the Senate intelligence committee launched an effort to protect the country’s election security after Russian agents targeted election systems in 21 states ahead of the 2016 general election. There’s no evidence that any hack in the November 2016 election affected election results, but the attempts rattled state election officials and prompted the federal government and states to examine the way votes are counted. Senators on the panel have criticized both administrations for not moving quickly enough to stem the Russian threat, and continued to do so at the hearing. Maine Sen. Susan Collins, a Republican, critiqued Nielsen’s opening statement, which described a series of efforts the department had already announced. “I hear no sense of urgency to really get on top of this issue,” Collins said, noting that 2018 elections are already underway. Collins noted that many state election officials have remained without security clearances, making it harder for the department to share information with them. “I hear no sense of urgency to really get on top of this issue,” Sen. Collins said, noting that 2018 elections are already underway. “We are doing our best to speed up the process,” Nielsen said, adding that the department has a policy in place to provide information on immediate threats to state and local election officials even if clearances have yet to be granted. Communication and intelligence sharing by the federal government has been a key concern among state and local election officials. Those officials complained that it took the federal government nearly a year to inform them whether their states had been targeted by Russian hackers. Collins, who has introduced legislation with other members of the committee to improve election cybersecurity, also pressed Johnson, asking if he should have issued stronger warnings in 2016 as it became clear that Russians were trying to intrude into the systems. Johnson defended the way he alerted state and local election officials, noting that in the late summer and fall of 2016 he was repeatedly issuing public warnings for those officials to get cybersecurity assistance from the department. “We were beating the drum pretty hard,” Johnson said. Before leaving office, the Obama administration designated the nation’s election systems as “critical infrastructure,” on par with the electrical grid and water supply. That decision prompted alarm among state election officials, who expressed concern the federal government was trying to take over elections that have long been the jurisdiction of state and local governments. Johnson said he had considered the move earlier, but had backed off because of resistance to states. Johnson also testified that during the 2016 election he contacted The Associated Press because he was worried about the possibility the news cooperative’s election results could be hacked. He said he called AP’s CEO Gary Pruitt about his concerns and came away satisfied that the company was taking appropriate precautions as it counted votes and analyzed results. The hearing follows a Tuesday news conference in which committee members from both parties said government efforts to protect state and local elections from Russian cyberattacks haven’t gone far enough. Top U.S. intelligence officials have said they’ve seen indications Russian agents are preparing a new round of election interference this year. Senators warned that it could be worse the next time around. “What it looks like is a test,” said Maine Sen. Angus King of the 2016 hacking attempts. The committee is recommending that states make sure voting machines have paper audit trails and aren’t capable of being connected to the internet. Senators also are pushing for better communication among the various U.S. intelligence agencies and federal, state and local governments. Senators are also urging state and local election officials to take advantage of Homeland Security Department resources, such as comprehensive risk assessments and remote cyberscanning of their networks to spot vulnerabilities. As of last month, just 14 states had requested risk assessments and 30 had asked for remote cyberscans of their networks, according to Homeland Security officials. But even that was straining resources, since many of those risk assessments have not been completed. The committee’s recommendations preview an election security report expected to be released in full in the coming weeks. It is the first of four reports planned as part of the panel’s wide-ranging investigation into Russian meddling in the 2016 election. The recommendations come as Congress is eyeing $380 million in state grants for election security in a wide-ranging spending bill expected to be unveiled as soon as Wednesday. The bill also contains $307 million for the FBI to go after Russian cyberattacks. The top Democrat on the intelligence panel, Virginia Sen. Mark Warner, has said he thinks the nation’s election security needs to be more robust, especially since Trump has not addressed the matter as an urgent problem. “It’s pretty amazing to me we’ve had the director of the FBI, the director of national intelligence and the head of the NSA say in public testimony within the last month that they’ve received no direction from the White House to make election security a priority,” Warner said.